Clear your schedule and don’t leave your home for at least a week. What’s going on you might ask? Well, you don’t have the flu, but you might want the flu instead of what’s to come. If you have ever felt this way about potty training your little squirt (no pun intended), then you are not alone. But don’t worry, there is hope. As a happy mother of four cute boys, I have successfully potty trained three of them. Just one left to go! Although I am not an expert and I know that every child is different, I have stuck to one simple rule that has made the potty training process quicker overall–sometimes even in one day. Yeah, you heard me, it is possible to potty train in one day. 7:15 a.m.: Diaper off. Underwear on. 11 a.m.: Success! Pee pee in the potty! 11:35 a.m.: Fifth accident … in the store. No diapers, so wet pants stay on. Noon to 7:30 p.m.: Three more accidents and one success. 7:45 p.m.: Bed time with no diaper. Day #2, 3, 4, 5, 6, etc. How did my cute little three-year-old remain accident-free after only one day? It’s simple. Once the diaper comes off, it NEVER goes back on (that includes pull ups too). And I mean never. So, as much as I wanted to put it back on when he went to bed or when we left the house, I stuck to my guns. Following this rule holds the child accountable for their own actions. If they have an accident, they have to deal with it. And they need to clean up the mess themselves as well. They are smart little whipper snappers. They catch on really quick that going in the toilet is much better than the alternative. Now, I am not saying that following this rule is a 100% guarantee, but it puts your child’s mindset on permanent path toward success. Trying to potty train a child and only requiring them to wear diapers part of the time is like driving on the wrong side of the road on odd days of the month. It doesn’t make any sense! 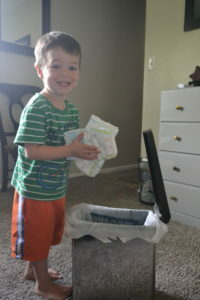 Of course, it’s not only about throwing the diapers away and never looking back. There are lots of other ways to motivate your child such as positive reinforcement, sticker charts, jelly beans, a potty-training teddy bear and so on. You can buy entire books on how to potty train. All of these things are wonderful, but I attribute most of my success in potty training to this one main rule. And I’m not the only one. Just ask my friend, JulieAnn. She has successfully potty trained five of her six children with almost no relapses by ditching the diapers for good! I’ve heard a lot of people say that girls potty train a lot earlier and easier than boys. That may be true and it may not be true. It depends on the child. Only you and your child can decide together when is the right time. For me and my three boys, the magical age was three years old. It may be different for you though. If you think they’re ready, give it a try. There’s no shame in taking a break and trying again later if it doesn’t work the first time. The key is staying consistent when you do start potty training. So, save some money (pull ups are expensive) and start your way down the road to potty training success. You won’t regret it. By the way, click on the FREE PRINTABLE handouts below for some fun potty training sticker charts that your kids will love. 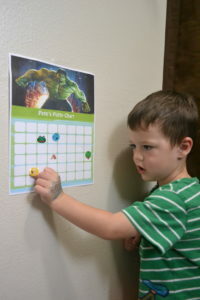 FREE PRINTABLE CHART FOR KID CAVITY FIGHTERS- Making Brushing Teeth FUN!